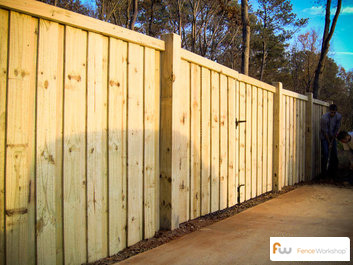 If you are interested in installing a Pressure Treated Pine wood fence, it’s important to make sure you purchase a quality material with the best pressure treated chemicals on the market. Pine fences that are pressure treated with the newer, safer, more natural looking MCQ (Micronized Copper Quaternary) treatment are the best choice. Micro pressure-treated lumber is clean and safe for handling and for the environment, and has a fresher, more natural appearance than other treated wood. Along with being safer, longer lasting and more natural looking, MCQ lumber is easier to stain or seal. MCQ pine lumber uses a copper-based preservative with a co-biocide and is building code compliant ICC-ES Reports, ESR-1980, ESR-2240. MCQ is also odorless, non-staining and non-irritating to humans, animals and plants and is ideal for a wide range of outdoor uses. Unlike the dark green pressure treated pine commonly seen here in the Southeast, the MCQ™ treatment has a much more natural look which initially weathers into a golden brown rather than gray. 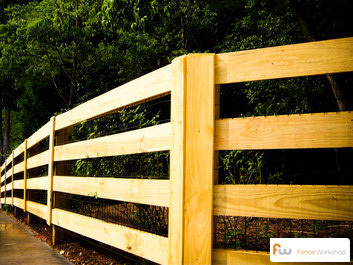 Pressure treated pine fences are usually fully constructed on site by expert installers. The of use hot-dipped galvanized ring-shank nails that will not rust is ideal, as they will not easily pull lose or stain fence pickets. All pressure treated posts should be set in belled holes with premixed concrete and Quick-rok™ for extra stability and longevity. Sealing and staining is an important step if you do choose to install a pressure treated wood fence. We suggest water sealing your pine fence around 3 months after installation. Water sealing your pine fence will keep your lumber from absorbing moisture and will help to prevent shrinking and warping. 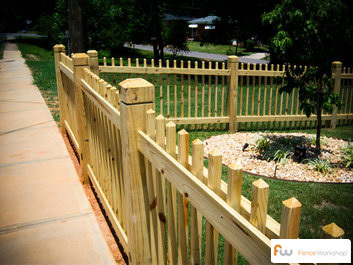 Stain (not to be confused with sealant) will protect your fence from both moisture damage and color-fading sun damage. The darker the tint, the better the protection will be. The best form of secondary protection for your pine fencing is a solid outdoor paint with a pre-coat of primer. Thanks to a unique treating process, consumers can enjoy wood the way Mother Nature intended; meaning, no more dark-green tint to wood. With pine privacy fences of the past and most competitor’s current pine fences, the ACQ™ treatment process caused the lumber to have a strong dark green tint and the fence would weather to a gray color. Our newer and longer lasting MCQ™ pressure treated pine has a much more natural look without the dark green tint. When properly maintained, MCQ™ pine lumber weathers to a golden brown color rather than a gray. Pressure treated pine lumber is treated with the first wood preservative certified as an Environmentally Preferable Product by the Scientific Certification Systems. This means it’s safe for handling, children, pets and plants. Where do we sell our Aluminum Fences? At Fence Workshop™ we supply a variety of fencing materials in Georgia, Florida and North Carolina areas like Atlanta GA, Athens GA, Augusta GA, Columbus GA, Macon GA, Savannah GA, Valdosta GA, Destin FL, Jacksonville FL, Orlando FL, Tallahassee FL, Tampa FL, Apex NC, Cary NC, Chapel Hill NC, Holly Springs NC, Raleigh NC, Wake Forest NC and many more.